How do you use and read signals on the ADX indicator for binary options and forex trading? On this occasion we will discuss trading strategies and tricks on the IQ Option platform. To be able to profit or win in trading, the trader must be able to analyze and predict where the next price movement is going. The trading analysis that we will discuss is technical analysis using the Average Directional Index Movement or ADX indicator. 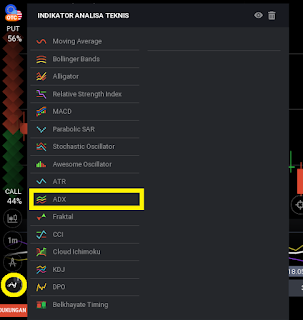 The ADX indicator serves to measure the strength of the trend and analyze the reversal of the direction of price movements. 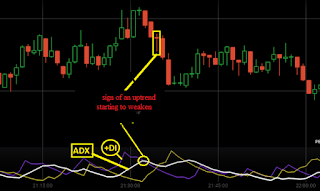 ADX is an indicator that aims to identify the direction of movement and strength of the trend. ADX indicators are made by Welles Wilder. 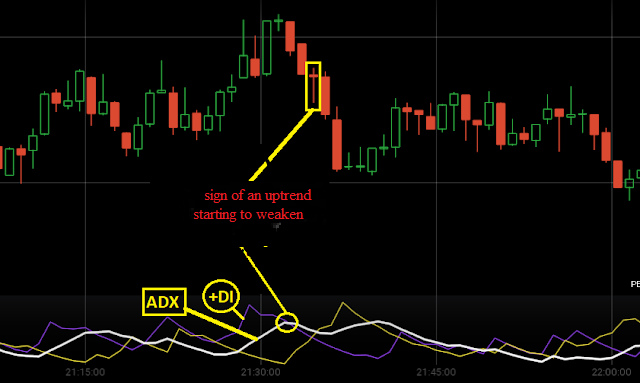 How it works the ADX indicator shows when the trend movement starts, how big the trend strength is and when the trend starts to weaken. 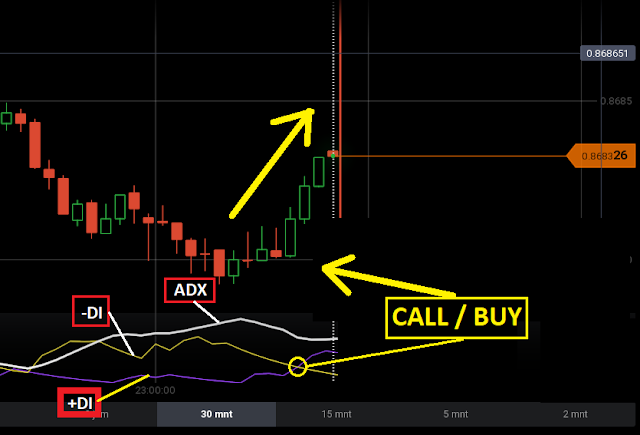 There is no limit on how many time frames are most suitable because actually ADX can work well on all trading periods. 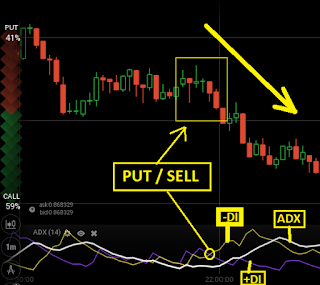 HOW DO I USE ADX INDICATORS? 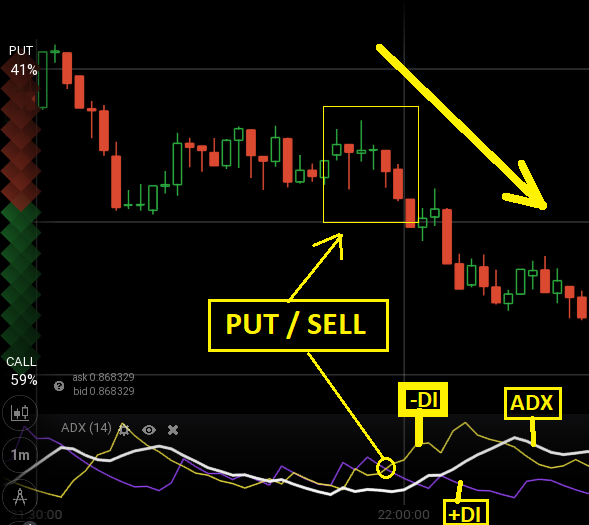 Before starting the strategy tutorial, we must remember the color of the third line of the ADX indicator as above. For this way we will wait for the trend reversal to be used to take open trading positions. When there will be a reversal or reversal, the ADX indicator will give a sign that is the DI line movement that cuts from the bottom up the other DI lines. Keep in mind the DI / cut line movement is only from the bottom up. The movement of the line + DI cuts the line - DI from the bottom up. Furthermore, in every trend movement will definitely experience a saturation point which results in a weakening trend. On the ADX indicator, we can find out the uptrend trend started to weaken by seeing the movement of the + DI line cutting the ADX (general) line from top to bottom. The movement of the line -DI cuts the line + DI from the bottom up. We will use the ADX and Parabolic SAR indicators simultaneously, for how to read the ADX indicator signal as above. 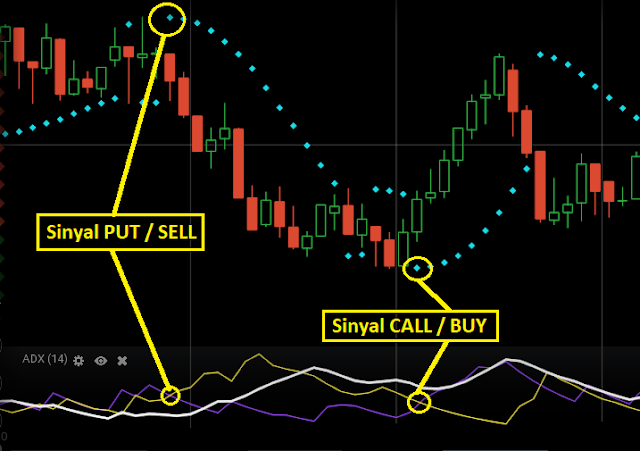 Make sure to only take an open position when both indicators have indicated the same signal direction. Now that's the strategy and tricks of trading binary options and forex on the IQ Option platform, just adapt to other platform users, because basically the use of indicators is the same. Hopefully this discussion can provide benefits and enlightenment for you in playing trading so that profit is consistent. 0 Response to "Strategi Cara Trading IQ Option Menggunakan Indikator ADX"